Champion Blue Flame® Motor Oil, a major product sponsor of Diesel Motorsports and the National Association of Diesel Motorsports (NADM), announced this week additional participation and contingency awards for Diesel Drag Racing and Sled Pulling competition. Champion Brands Blue Flame® Performance Diesel Motor Oils are formulated with workhorse performance additives, superior protection, advanced polymer technology, and high TBN, supported by a carrier blend of synthetic and conventional base fluids. 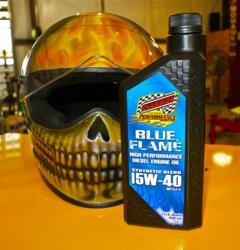 In addition, Champion Brands Blue Flame® Diesel Motor Oil delivers unmatched high temperature film strength and lubricity protection, has the muscle to combat oil shear, maximizes and sustains cylinder compression, and is proven to increase engine horse power and torque. About the company: Champion Brands, LLC, is a globally recognized industry leader in specialty lubricants for over 55 years. Champion also produces and blends over 300 products including fuel, oil, engine additives, and lubricants for the racing, automotive, heavy truck, agricultural, industrial, and specialty markets. For more information about the Champion Blue Flame® Performance Diesel Motor Oil contact your nearest Champion distributor, or call Champion at 800-821-5693 or 660-885-8151. Champion Brands, LLC; 1001 Golden Drive, Clinton, MO, or go to http://ChampionsUseChampion.com.